Citation: Kumari MVL, Kaviarasi A, Anandhavadivel A, Prabakaran AR. Characteristic Studies on Thin Films of Epoxy resin in Organic Solvent. Int J Chem Sci. 2018;16(4):297. Epoxy resin in organic solvent is cured and thin films are prepared by solvent evaporation method. In the present work, the said organic solvent is used as curing agent in the sample. Both the concentration of polymer as well as curing agent is varied in wt/wt ratio and films are prepared for FTIR spectroscopic response. The FTIR observation of title compound confirms functional groups and the role of curing agent. Dielectric studies are carried out at different temperatures. Mechanical studies are also performed on the sample which confirms the toughness, textural and tensile strengths. Thin films play an important role in the development and study of materials with new and unique properties. Polymers are huge molecules that are encountered in nature as well as in our modern technology. Epoxies are versatile from the view point of chemical structure, as well as physical and mechanical properties . Epoxy resin is defined as a thermoset polymer structure with high adhesion properties and cohesive strength because, when cured, it is irreversibly rigid and relatively unchanged by heat . Due to excellent mechanical, electrical properties and chemical stability, epoxy resin (EP) curing products are widely used in electronics, machinery, construction and other industries . Epoxy resins are widely utilized for coatings and structural applications, adhesives and composites for microelectronic encapsulants. Among the various families of cross linking resins, epoxies are widely used due to their exceptional performance, coupled with very easy usage methods and limited cost. To achieve the high-performance properties of epoxy resins, uniform dispersion after mixing is important . The epoxy resins are converted into cured epoxy resins, which are solid, infusible and insoluble 3-dimensional networks, with the help of curing agents, which can undergo chemical reactions with the epoxy rings of the epoxy resin. Epoxy resins are reactive chemicals which are combined with other chemicals known as hardener or curing agent such as triethylenetetramine (TETA) and 4,4´-diaminodiphenylsulfone (DDS) to give systems capable of conversion to predetermined thermoset products . When curing agent is aliphatic amine curing process occurs at room temperature, but the reaction is slow . Epoxy resin is defined as a molecule containing more than one epoxide groups. The epoxide group also termed as, oxirane or ethoxyline group, is shown below FIG. 1. Figure 1: Structure of Epoxy Resin. Triethylenetetramine, abbreviated TETA and trien and also called trientine (INN), is an organic compound with the formula is shown in FIG. 2. 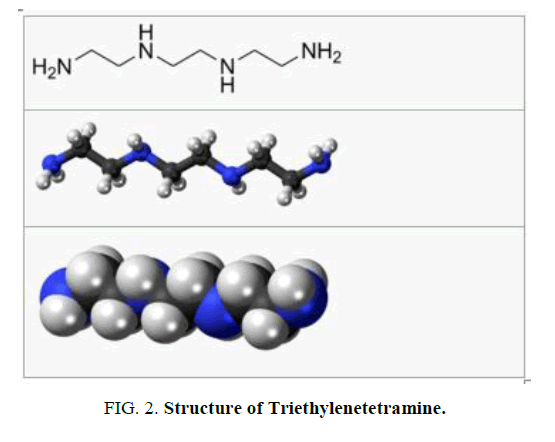 Figure 2: Structure of Triethylenetetramine. It is oily liquid colorless but assumes yellow color due to impurities resulting from air oxidation. It is used as stabilizer for epoxy resins. Epoxy resin was purchased from Roto Polymers, Chennai. The thin films of epoxy resin with curing agent triethylenetetra amine of various thicknesses are prepared. Homogeneous mixture of epoxy resin and curing agent was prepared using magnetic stirrer Remi model. The thin films of concentrations are prepared by varying both the concentrations of resin and curing agent. The thin films of concentration 2%, 3.8%, 6%, 9%, 16% of curing agent are prepared. The film thickness varies from 0.45 mm to 0.69 mm. The film thickness was measured by using air wedge apparatus. No variation in the physical property of the thin films is detected after exposing the sample to open air for 10 days. Cross linked polymers such as epoxy networks cannot be characterized easily because of their insolubility and infusibility. FTIR spectroscopy has been proved to be a suitable nondestructive method to investigate cured epoxy resins . Analytical techniques such as differential scanning calorimetry and Fourier transform infrared (FTIR) spectroscopy are used extensively to characterize the cross-linking of thermosetting resins . The interference pattern obtained from a two-beam interferometer as the path difference between the two beams is altered, when Fourier transformed, gives rise to the spectrum. The transformation of the interferogram into spectrum is carried out mathematically with a dedicated online computer. The Perkin Elmer Spectrum Two FT-IR instrument consists of globar and mercury vapor lamp as sources, an interferometer chamber comprising of KBr and mylar beam splitters followed by a sample chamber and detector. Entire region of 4000 cm-1-450 cm-1 is covered by this instrument. The spectrometer works under purged conditions. Solid samples are dispersed in KBr or polyethylene pellets depending on the region of interest. This instrument has a typical resolution of 0.5 cm-1. Signal averaging, signal enhancement, base line correction, normalization and other spectral manipulations are possible. The FT-IR Spectroscopy is also carried out by using ATR Diamond Accessory. Reflection which occurs when, an absorbing coupling mechanism acts in the process of Total Internal Reflection to make the Reflectance less than unity. In this process if the absorbing sample is placed in contact with the reflecting surface, the reflectance for total internal reflection will be attenuated to some value between greater than zero and unity in regions of the spectrum, where absorption of the radiant power can take place. The mechanical properties are often most important property related for technology. The definition of dielectric relates to the permittivity of the material. The permittivity is the ability of a material to polarize with respect to an applied field. Physically, it means the greater the polarization developed from the material in an applied field of given strength, the greater the dielectric constant will be. In earlier days, inorganic materials like mica and silica are used to prepare these dielectric materials. But with the advance of polymeric materials, polymeric materials have taken the place of inorganic materials . The pure epoxy (without curing agent), curing agent, thin films of epoxy with curing agent were subjected to FTIR studies. FTIR spectra were recorded from the range 4000 cm-1 to 400 cm-1. FTIR spectrum of pure epoxy resin is shown in FIG. 3. FTIR spectrum of curing agent is shown in FIG. 4. 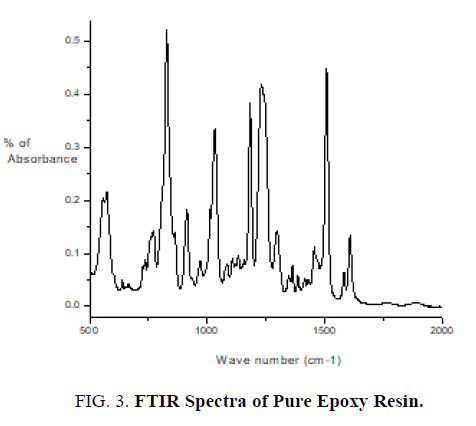 Figure 3: FTIR Spectra of Pure Epoxy Resin. 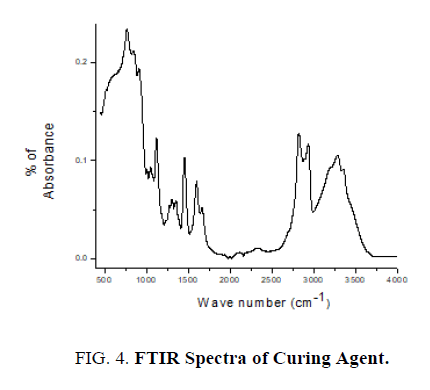 Figure 4: FTIR Spectra of Curing Agent. FTIR spectrum of epoxy resin with 6% of curing agent is shown in FIG 5. Stretching of C-C aromatic ring occurs at 1506 cm-1-1507 cm-1 for concentrations of 6%, 9%, 16% of curing agent with epoxy resin. C-O Stretching occurs at 1180 cm-1-1181 cm-1 for concentrations of 6%, 9%, 16% of curing agent with epoxy resin. Stretching of C-O-C ethers occurs at 1010 cm-1-1011 cm-1 for concentrations of 6%, 9%, and 16% of curing agent with epoxy resin (FIG. 5). The variation of area of these functional group of FTIR spectra with percentage of curing agent was studied and it is found for particular functional group corresponding to particular wave number the area decreases with increase in percentage of curing agent 6%, 9%, 16%, confirmed from below listed TABLE 1. TABLE 1 and FIG. 6 confirm the role of curing agent. 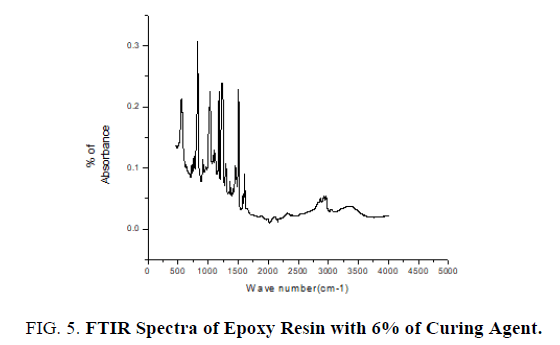 Figure 5: FTIR Spectra of Epoxy Resin with 6% of Curing Agent. Figure 6: Variation of area of functional group with concentration of curing agent. Table 1: Variation of area of functional group with varying concentration of curing agent. Thin films of epoxy with varying concentrations of curing agent 6%, 9%, 16% are subjected to mechanical studies. Applied forces on the films are varied. FIG. 7 shows the stroke Vs stress graph of epoxy resin with 6% of curing agent. It is found that as % of curing agent increases the tensile strength, flexural strength, toughness also increases confirmed from the TABLE 2. FIG. 8 confirms as % of curing agent increases all mechanical parameters (tensile strength, flexural strength, toughness) also increases. Once again mechanical studies also confirms role of curing agent is to increase the hardness of films. Above listed concentrations responded well for a mechanical study. 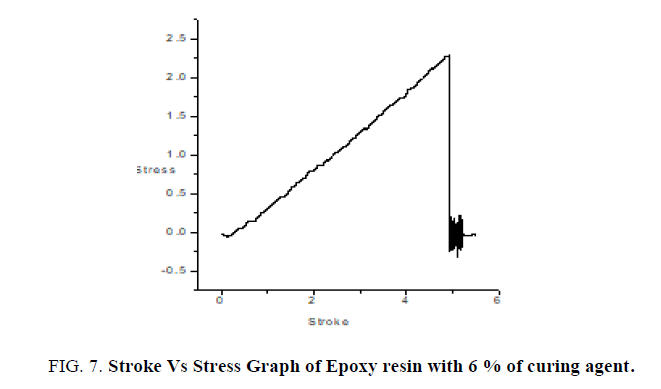 Figure 7: Stroke Vs Stress Graph of Epoxy resin with 6 % of curing agent. Figure 8: Variation of Mechanical Parameters with varying concentrations of Curing Agent. Table 2: Variation of mechanical parameters values with varying concentration of curing agent. Thin films of epoxy with curing agent of varying concentrations are subjected to dielectric studies at particular temperature. From the FIG. 9 it is confirmed as frequency increases dielectric constant decreases. Figure 9: Variation of Frequency with Dielectric Constant of Epoxy resin with 16% of Curing Agent at 150°c Temperature. From FTIR studies as percentage of curing agent increases the area of the functional group increases which confirms curing agent is used to increase the hardness of film. From mechanical studies as percentage of curing agent increases the tensile strength, flexural strength and toughness also increases. From the dielectric studies it is confirmed as frequency increases dielectric constant decreases. Unnikrishnan KP, Thachil ET. Toughening of epoxy resins. Des Monomers Polym. 2006;9(2):129-52. Fouda H, Guo L, Yue Y, et al. Synthesis and Characterization of Hybrid CF/MWCNTS/Epoxy Resin Composite System. In IOP Conference Series: Materials Science and Engineering. 2017;220(1); 012021. Ma H, Hu N, Wu C, et al. Synthesis and research of epoxy resin toughening agent. Springer Plus. 2016;5(1):806. Yoshida S. Quantitative evaluation of an epoxy resin dispersion by infrared spectroscopy. Polym J. 2014;46(7):430. Singh VK, Bansal G, Agarwal M, et al. Experimental determination of mechanical and physical properties of almond shell particles filled biocomposite in modified epoxy resin. J Material Sci Eng. 2016;5(246):2169-0022. Razack NA, Varghese LA. The effect of various hardeners on the mechanical and thermal properties of epoxy resin. Int J Eng. 2014;3(1). Scherzer T, Strehmel V, Tänzer W, Wartewig S. FTIR spectroscopy studies on epoxy networks. In Physics of Polymer Networks. 1992;90:202-5. Pandita SD, Wang L, Mahendran RS, et al. Simultaneous DSC-FTIR spectroscopy: Comparison of cross-linking kinetics of an epoxy/amine resin system. Thermochimica acta. 2012;543:9-17. Pattanaik A, Bhuyan SK, Samal SK, Behera A, Mishra SC. Dielectric properties of epoxy resin fly ash composite. In IOP Conference Series: Materials Science and Engineering 2016;115(1): 012003.